Another good day. 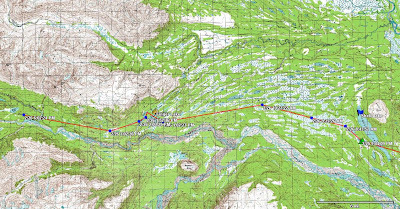 Mike rolled by the third checkpoint, Finger Lake, around 1:30pm (AK time) today. That's 130 miles from the start. If you compare his time to the race leaderboard, he's in 23rd or so place. Pretty impressive considering he's not racing and carrying more weight than anyone else out there. So it would seem things are going very well. Trail reports for the upcoming section report soft sugary snow, so it may be that the fully loaded Snoots gets a real flotation test very soon. It will be interesting to see if we notice a significant slow down or not. Weather still looks good - about the same as yesterday. Fairly calm and warm at 9 degrees in Puntilla. No more mention of precip wednesday night. I have Mike's GPS files for last year's trip (with the Snoots and V2 trailer), and he's running about six hours ahead of himself last year. Interestingly he camped at nearly the same spot last year (Shell Lake) on the second night. But the difference is that in '07 he started early--10am--the first day, while his start was more like 2:30pm this year. 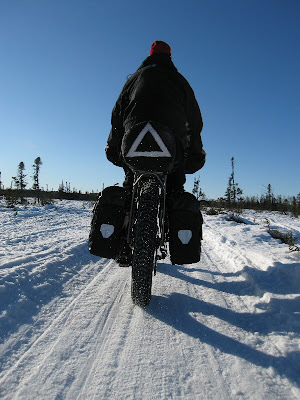 Hard to say whether the speed up is due to good trail conditions or the new panniers version of the Snoots. Probably a little bit of both. Those familiar with Mike's trip last year will remember that he never made it over the Alaska Range (by Rainy Pass). High winds and storms kept him on the eastern side for days while he made attempts to push his way over. No doubt this is on his mind as he makes his way into the mountains this evening. Track points continue to be erratic. I waited for the last three hours for another point to come in so that the map would be more representative of the day's journey. But earlier in the day points were coming in at 10 minute intervals. A good guess is that the mountains to either side of him are making it harder to get a clear line to the satellites. Having said that, two more points have come in since I generated the map, separated by only 10 minutes. Go figure. Tomorrow Mike will pass the 4th checkpoint (Puntilla) and then we will see, in real time, whether he decides to try Rainy Pass or whether he detours to Hellsgate (a 32 mile but possibly faster alternate route). One thing is for sure, the weather is a heckuva lot better than last year. The reports of the front runners having to sideslope the Dalzell Gorge (on the other side of Rainy Pass) due to overflow are a little concerning. I don't know if Mike will have any way of getting advance information, but sidesloping with his heavily loaded bike could turn into quite a deal. We'll have to stay tuned to the race news page for further info on Dalzell Gorge. Yep, there are cabins at Shell Lake. I know Mike stayed in one back in 2001 after injuring his ankle. 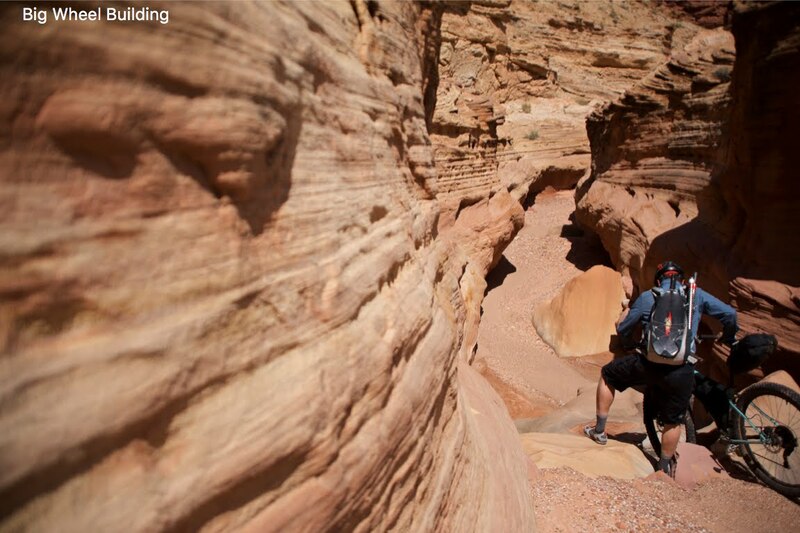 One question: Do those front panniers provide any noticeable windbreak for your feet/toes? Thanks for the updates, Scott! I'm not at all familliar with the course and only Mike through MTBR and through ordering a set of wheels from him, but this is some great reading.